Ethiopian Airlines will launch three-times-weekly scheduled service to Newark Liberty International Airport from Addis Ababa, via Lomé in Togo, on July 3. Star Alliance member carrier Ethiopian has served Newark in the past but suspended its service in 2004 in order to serve Washington Dulles International Airport instead. On January 20, Ethiopian announced it would resume service to the New York metropolitan area on July 3 but indicated it was planning to serve New York JFK rather than Newark. It may be that the Star Alliance affiliation of United Airlines, which has a major hub operation at Newark Liberty International Airport, persuaded Ethiopian to serve the New Jersey airport instead of JFK in order to maximize its passenger-traffic feed opportunities within the Star Alliance network. 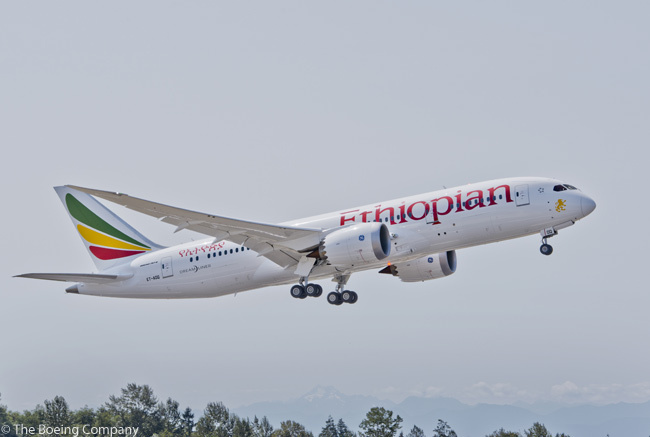 Ethiopian Airlines will operate Boeing 787-8s on its Addis Ababa-Lomé-Newark route. Each Ethiopian 787-8 is configured with 24 business class and 246 economy seats. 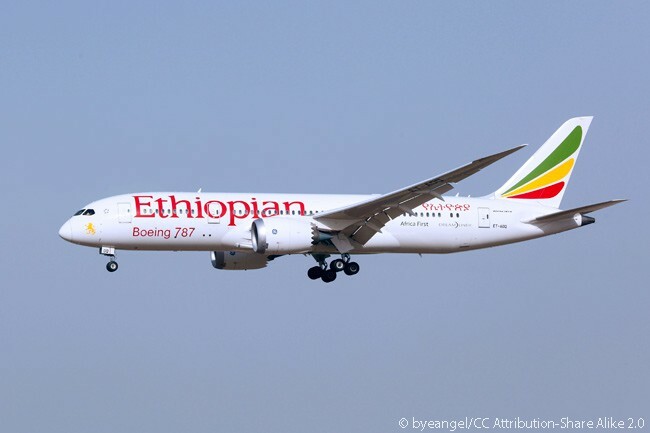 Ethopian’s schedule for the outbound trip will see flight ET508 depart Addis Ababa’s Bole International Airport (IATA code ADD) at 9:45 a.m. on Tuesdays, Thursdays and Sundays from July 3 and arrive at Lomé-Tokoin Airport (LFW) at midday local time. The aircraft will leave LFW again at 1:00 p.m. on Tuesdays, Thursdays and Sundays from July 3 and reach Newark Liberty International Airport (EWR) at 7:15 p.m. local time. On the return trip, flight ET509 will push back from the gate at EWR at 9:15 p.m. on Tuesdays, Thursdays and Sundays from July 3 and land at LFW at 11:30 a.m. the following morning, local time. The aircraft will then leave LFW again at 12:30 p.m. on Wednesdays, Fridays and Mondays from July 4 and touch down at ADD at 9:15 p.m. local time. The service will allow passengers to connect between Newark and many cities throughout Africa, according to Ethiopian Airlines. At Lomé, passengers be able to connect to and from cities in West Africa with ASKY, Ethiopian’s partner airline, which is based at Lomé–Tokoin Airport. Connections will be available to and from Abidjan, Bamako, Bissau, Brazzaville, Conakry, Dakar, Douala, Kinshasa, Lagos, Libreville, N’djamena, Niamey, Ouagadougou and Yaoundé. At Addis Ababa, passengers will be able to connect to and from cities in East and Southern Africa, including Nairobi, Dares Salaam, Khartoum, Kampala, Kigali, and Johannesburg. “We are thrilled to resume our service to New York, our fifth gateway in the Americas,” says Tewolde GebreMariam, group CEO of Ethiopian Airlines. “New York is one of the world’s most economically powerful cities and including it in our ever-expanding network will play a critical role in the expansion of trade, tourism and investment between the fast-growing continent of Africa and the United States,” adds GebreMariam. Newark will become Ethiopian’s 93rd international gateway and its fourth gateway in North America. Ethiopian operates daily non-stop flights from Washington Dulles International Airport to Addis Ababa, as well as three-times-weekly non-stops from Toronto to Addis Ababa and three-times-weekly flights from Los Angeles to Addis Ababa via Dublin. In the past year Ethiopian has launched service to Tokyo, Manila, Dublin, Los Angeles, Cape Town, Durban, Gaborone, Yaoundé and Goma. Ethiopian is implementing a 15-year strategic plan called Vision 2025 that will structure the company into seven business centers: Ethiopian Domestic and Regional Airline; Ethiopian International Passenger Airline; Ethiopian Cargo; Ethiopian MRO; Ethiopian Aviation Academy; Ethiopian In-flight Catering Services; and Ethiopian Ground Service. According to Ethiopian, it has registered average annual growth of 25 per cent throughout the past seven years.